OT’s with Apps @ School Workshop 1 & 2 – A Big Thanks to All! A BIG Thank – You from Erin and I to the participants of the OT’s with Apps @ School Workshop for enduring 2 days of OT App – lication! The collective wisdom shared by all OT’s attending was really fabulous – it is so exciting to be with peers sharing their expertise! Also a big Thank – You to ATR for hosting the workshops. It was a great location with Wi-Fi readily available (after a bit of management of downloading…) and even an iPad repair person available (Thank you Rick)! Interested in attending a workshop? Drop us an email at otswithapps@gmail.com, Carol@adaptivetr.com or Shantell@adaptivetr.com we’d be happy to explore options or notify you of any upcoming OT’s with Apps workshops! This entry was posted in Apps for OT's, Continuing Education, Occupational Therapy and tagged App Review, occupational therapy, OT Apps, special needs students. Bookmark the permalink. 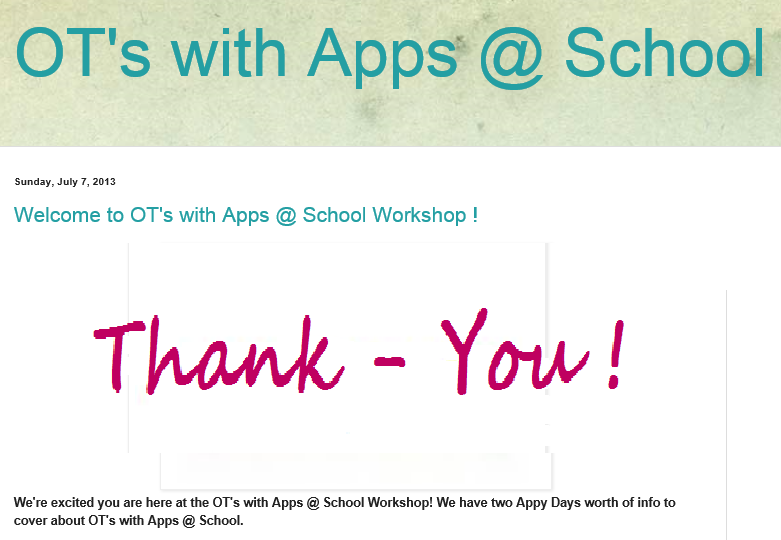 1 Response to OT’s with Apps @ School Workshop 1 & 2 – A Big Thanks to All!